As more and more Christians find themselves trapped in patterns of sexual, emotional and financial sin, the church desperately needs resources for prevention, intervention and restoration. 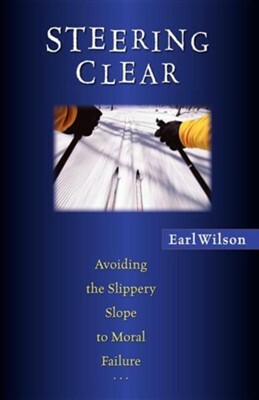 Counselor Earl Wilson provides a penetrating look at the slippery slope to moral failure, uncovering how our self-delusions fuel ethnical compromise. With psychological and biblical insight he identifies how distorted thinking leads to secretive behavior, and he describes effective strategies for breaking bad habits. Only by bringing such things to light can we open the door to true repentance, change and freedom. Here is practical help for those who want to get off and stay off the slippery slope, as well as hope and healing for those picking up the pieces after a crash. Though the road may not be easy, forgiveness and wholeness are possible. This book serves as an essential companion for those who want to live with integrity and those who minister to them. I'm the author/artist and I want to review Steering Clear: Avoiding the Slippery Slope to Moral Failure.